How the HELL do I go from eating meat to eating kale? What am I going to eat instead of cheese? I’m going to tell you something about me: I am the QUEEN of overthinking. I am not the originator of this acronym, but DAMN has it saved my life. Don’t worry. 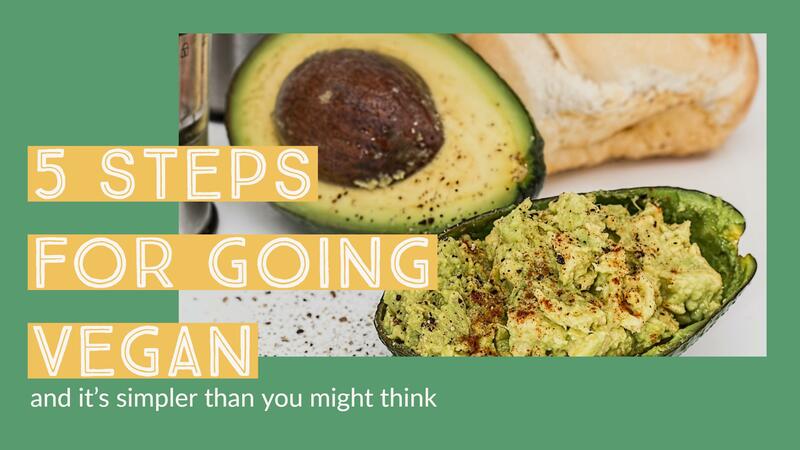 Going vegan is WAY easier than you might think. The key is to take everything with a grain of salt and not over-analyze ANYTHING. Make sure you do PLENTY of research about nutrition. As much as I love veganism and what it stands for, you have to learn how to replace things you’re no longer eating. You’ll want to understand all the pros and cons and benefits. Read articles, blogs, and books. There are plenty of resources out there, and blogs can help break it down in a way that’s simple for you. A lot of the time, they’re written by someone who’s got a personal experience, so they’ll be super relatable. Feel free to keep tabs on my blog here at The Singin’ Vegan Chick. My blog posts are always chock-full of links and info for new vegans to check out. I won’t recommend it if I don’t think it’ll be helpful. I also won’t take it personally if you choose to double check anything that I say or take it with a grain of salt. That’s why I’m going to recommend that you follow other blogs, too. My personal favorite stop for quick info is I Love Vegan, but there are plenty of great blogs out there. Too many to count in this blog post, so take your pick from this list, courtesy of The Minimalist Vegan. Another personal favorite of mine is YouTube. There are so many vegan vloggers out there who offer great tidbits of info. I absolutely love this woman named Ali Kamenova . She gives great vegan advice, as well as some pretty badass Yoga classes. If you like what you see on her channel, check out her official site, too: alikamenova.com. Here, you can start a membership and get specialized training courses and meal plans. She, too, encourages you to do your own research on the info she gives you. That’s why I like her. This is crucial: give yourself time to adjust to new things. I didn’t go vegan ‘cold turkey’. I started out by making healthier choices: eating less salt, cutting out processed foods, etc. This made it easier to adjust to the new foods while I did more research. From there, I reduced the amount of meat that I ate. I’ve never been much of a red meat eater, anyway, so eating less of that was pretty easy. I focused most of my attention on eating less pork and chicken. By this time, I considered myself a pescatarian, eating the occasional sushi roll or crab dip. But I would go on to phase that out, too. This is a continuation of the 2nd step. From my experience, you never want to jump into the deep end on the first go. You need to learn how to swim first. You start simple and work your way up. This is how you want to approach going vegan. For one thing, your taste buds will need time to adjust to new foods. Almost everything we eat is an acquired taste. Our taste buds develop to enjoy whatever’s most available to us. You can rewire them the same way. Start by trying new things in the place of things you used to eat all the time. Use a little less salt here or there, switch out the white bread with some whole grain…you get the picture. I also recommend you allow yourself to cheat every once in awhile. Yes, I’m going exactly where you think I’m going. If you’re used to eating meat and dairy, give yourself one or 2 days a week not to worry about sticking to your diet. This is a tried and true method that a lot of people use when they’re trying to get in shape or stick to a new diet. It’ll make it so much easier to stick to your diet during the rest of the week. From there, you can start switching out old favorites for new ones. For instance, instead of my morning omelet, I started making a big smoothie in the mornings. Then, for the rest of the day, I didn’t eat meat. I’d also try to stay away from obvious dairy products, but didn’t sweat it if something had butter instead of oil. I did this with each meal until I was no longer eating anything with eggs or dairy in it. I got used to it. Even started to enjoy it. Now, I learned this the hard way, but MAKE SURE YOU ALWAYS HAVE ENOUGH TO EAT. Most plant foods have a lower caloric density than animal products. I don’t worry about counting the calories unless I’m eating something super oily or processed. Other than that, I eat until I’m satisfied. Everyone has foods they adore before they go vegan. For me, it was a big bowl of pasta with cheese or cream sauce. Going back to the “cheat day” concept, I’d say it’s ok to sample from these now and again when you’re first starting out. I mean, let’s say you’re on vacation in a new place. It’s a new situation that you may not have enough info to navigate just yet. In this case, cut yourself some slack. Also, don’t freak if you’ve been eating a food that you thought was vegan and actually isn’t. We have ALL been there, trust me. As the great Lewis Black once said, “What’s great for you might kill the person sitting next to you”. That was from his Black on Broadway tour. There is no known diet that’s ideal for every person. If you’ll pardon this next cliche, we are special snowflakes. No person is exactly like the other. The details are too vast. Our meat and dairy industries are FAR from ethical. The current practices are NOT sustainable for our environment. The amount of food, land, and energy it takes to feed livestock is A LOT. Cows fart and burp and produce greenhouse gases, too. We have to have more of them to feed more of us. It’s all processed, and it’s expensive otherwise, so the damage isn’t worth it. Many things I’ve read so far support this opinion. But that’s why it’s my opinion. I mean, there’s scientific evidence that supports damn near EVERYTHING now. Some doctors still say that there are benefits in animal products that you can’t get from plants. According to those doctors, grass-fed or cage-free is ideal. The products are better for us than those gathered from conventional methods. Other docs lean more towards veganism. They believe that a plant-based diet is a new ideal for healthy living. See this article on the accuracy of the What The Health movie. Published on mindbodygreen.com, it visits both sides of this argument. It’s great for perspective and doesn’t take part in the echo chamber that is vegan or non-vegan. No one can tell you exactly what’s best for you. Sometimes, the only way to learn is through trial and error, and this is no different. Hear people out on what they suggest. Fact check everything you find out. Even if someone is “right” about something, you won’t accept anything until you’re ready. Only you will know when you are. Combine a little of everything that works to shape a vegan diet that works for you. Like I said in the intro, keep it simple. Make sure that the info you’re getting is well-rounded. Avoid intellectual ghettos like the plague. Going vegan is about the journey, not the destination. Find what works best for you and stay open to new things. Could you go vegan knowing what you know now? How long could you do it? 15 days? 30 Days? Hit me up on Instagram or Twitter and let me know how you did! You are so welcome!Thank you for your time and your feedback, it is greatly appreciated :). Great post, what I love about being Vegan is the health benefits. On a curious note, does it aid weight loss? wonderful tips. I am going vegan little by little. I am eating more greens now than ever but can’t give up my love for chicken yet.